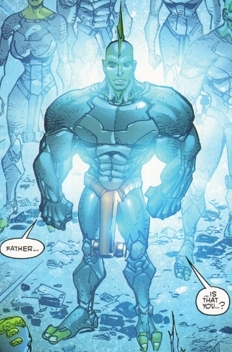 Powers: Emperor Kurr has vast superhuman strength. His legs are strong enough to enable him to leap a maximum height of 460 feet straight up in the air, and a maximum distance of 945 feet. He is capable of lifting (pressing) approximately 34 tons. He is very nearly impervious to flame. His skin acts like a bullet proof vest; a bullet isn’t capable of penetrating it but a sharp knife thrust by a super human arm can. When Emperor Kurr first led his people to Earth and opted to exterminate all of humanity, his two chief scientists decided to rid themselves of their evil leader. Weiko had his daughter Geeta sleep with Kurr but she ended up getting killed. A fertilized egg was recovered from her remains and was incubated to the point of a safe birth. Emperor Krull was born and he became the new ruler of the Krylan race, a peace-loving young man whose personality meshed much better with his people. He continued to lead his species in search of a world to become their new home. After Kurr was restored, he sent a signal to the Krylans and advised them to return to Earth. By the time the Krylans had arrived on Earth, Kurr had been killed by Dragon who had travelled back from the future with Damien DarkLord. Dragon was in turn slain by DarkLord who then departed. Krull knew that the Krylans could not take Earth as their new homeworld and prepared his people to continue their quest in space once more. He opted to first visit with his half-brother Malcolm Dragon, confirming the fact that Dragon truly was an alien. Malcolm was offered a place amongst the Krylans but he refused, preferring to live with his step-sister Angel and the Darlings. Krull wished his brother well before teleporting back to his vessel, happy that at least one of his people has found a home. Shortly after this visitation, Krull appeared twice more with a new ally by his side. He and Damien DarkLord entered into the laboratory of Rex Dexter and took Virus, still trapped in suspended animation. They then broke into a government facility where they recovered the remains of Emperor Kurr, their actions being caught on camera. Jake Farrell showed the resulting footage to Malcolm and Angel who could not quite fathom what Krull was up to, although Malcolm hoped that it would somehow bring about the return of Dragon. Krull and DarkLord are able to revive Dragon and Krull introduces himself as his son even though he was conceived by Dragon when he was Kurr. Krull and DarkLord inform Dragon of what had transpired during the last few years while Dragon was in the state of mind of Kurr. Within almost no time at all, Dragon takes command of the Krylans away from Krull. Despite Krull’s pleas, Dragon sets upon a course of eradicating all of the Tyrrus Combine off of the planet of Kalyptus which Dragon succeeds at via the Scourge Virus. Upset, Krull challenges Dragon to a blood match to the death as he believes Dragon must die. However, Dragon easily defeats Krull and spares Krull’s life. Dragon decides to instate a system of Democracy with the Krylans and decides to leave. Before he leaves, he has a quick goodbye exchange with Krull. When the Tyrraneans seek vengeance on the Krylans for massacring many of its people, Emperor Krull is torn to pieces by the Tyrranean army.